The great jazz saxophone player John Coltrane was born 87 years ago today. 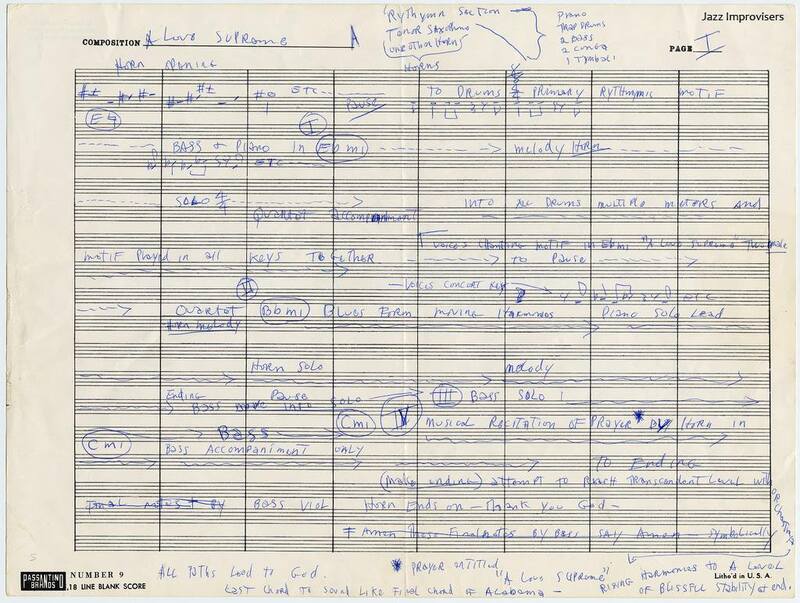 To mark the occasion we present this rare document from the Smithsonian's National Museum of American History: Coltrane's handwritten outline of his groundbreaking jazz composition A Love Supreme. Recorded in December of 1964 and released in 1965, A Love Supreme is Coltrane's personal declaration of his faith in God and his awareness of being on a spiritual path. "No road is an easy one," writes Coltrane in a prayer at the bottom of his own liner notes for the album, "but they all go back to God." If you click the image above and examine a larger copy of the manuscript, you will notice that Coltrane has written the same sentiment at the bottom of the page. "All paths lead to God." The piece is made up of a progression of four suites. The names for each section are not on the manuscript, but Coltrane eventually called them "Acknowledgement," "Resolution," "Pursuance" and "Psalm." Coltrane more or less finished his improvisation, and he just starts playing the "Love Supreme" motif, but he changes the key another time, another time, another time. This is something very unusual. It's not the way he usually improvises. It's not really improvised. It's something that he's doing. And if you actually follow it through, he ends up playing this little "Love Supreme" theme in all 12 possible keys. To me, he's giving you a message here. In section IV of the manuscript, for the part later named "Psalm," Coltrane writes that the piece is a "musical recitation of prayer by horn," and is an "attempt to reach transcendent level with orchestra rising harmonies to a level of blissful stability at the end." Indeed, in the same NPR piece which you can listen to below, Rev. Franzo Wayne King of the Saint John Coltrane African Orthodox Church in San Francisco describes how his congregation one day discovered that Coltrane's playing corresponds directly to his prayer at the bottom of the liner notes. In addition to Porter and King, NPR's Eric Westervelt interviews pianist McCoy Tyner, the last surviving member of Coltrane's quartet. The 13-minute piece, "The Story of 'A Love Supreme,'" is a fascinating overview of one of the great monuments of jazz. McCoy Tyner was not the drummer, he was the pianist. Thanks AWG. I certainly knew that, but my typing fingers sometimes seem to have a mind of their own. I’ve made the correction. Hard to believe a mistake like that. Elvin Jones was the defining drummer for McCoy Tyner. Coltrane would have been 87 today, not 88.
phenomenal, seminal album. masterful on every level. This is sacred. Thank you. Thanks, John, for the insight and for the correction. As for an enlargement of the manuscript, it should appear large enough to read if you click the image above. Interesting looking at the list of rhythm instruments at top. 2 bass, and is that 2 congas and 1 timpano? Or 1 timbal? Did he have a fuller rhythm section in mind? what a great little article. thanks. and thanks for the media content as well. Thank you for this article, I would’ve been interested what Tyner says in more depths. VERY GOOD INTERVIEW AND SOUND TRACK. BIG FAN OF COLTRANE. For a year John Coltrane carried with him on the road Volume Two “The mysticism of Sound and Music” a compilation of the lectures of the brilliant musician and mystic Sufi Inayat Khan who delves deeply on this subject. I met Hamsa el-Din, the Sudanese Oud player, whose “Waterwheel” album is captivating, at a Sufi Gathering in 1975 in Marin County.